Music: Orchestration (piano score) by the members of the Tams Music Library, New York City. Notes: 1. Lloyd F. Lonergan adapted Liebler's 1913 stage play, Joseph and His Brethren, written by Joseph Napoleon Parker, to create the scenario for this film. At first the film was called by that name; then Joseph, Son of Jacob was used. 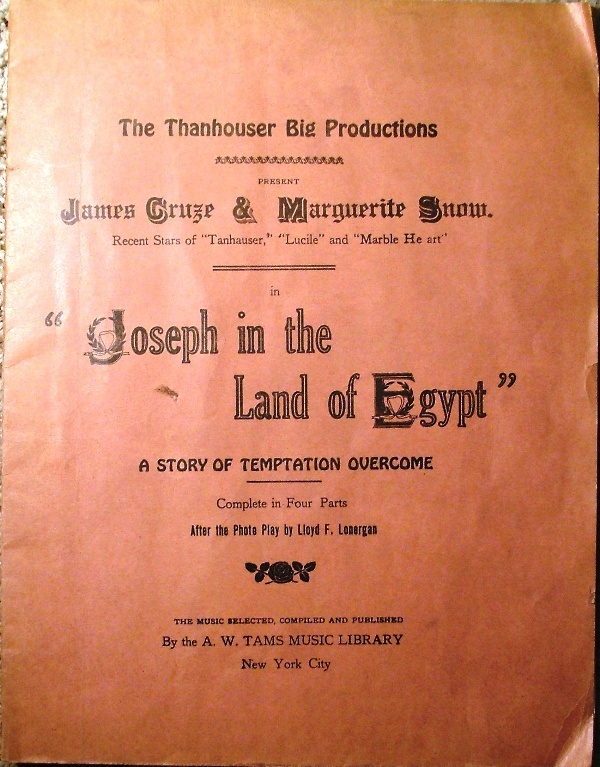 The Morning Telegraph, December 28, 1913, reported that the title had been changed to Joseph in the Land of Egypt. Another film based upon this play, Joseph and His Coat of Many Colors, was made by the Dormet Film Company, Inc. in 1914 and released on a states rights basis. 2. A note in Reel Life, December 27, 1913, stated that Michael Schliesser, keeper of the "Thanhouser Zoo," had trained camels for this film. 3. 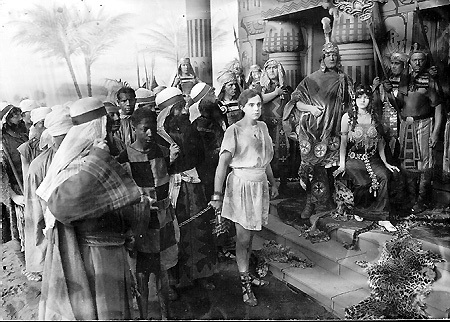 A scene from this film was used to illustrate the cover of the January 17, 1914 issue of Reel Life. 4. 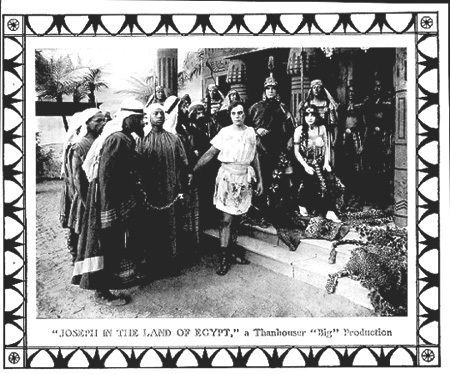 A competing, related film with the same subject matter, Joseph's Trials in Egypt, was released by Eclectic in three reels the day after, on February 2, 1914. The Eclectic version was reviewed in The Moving Picture World, February 21, 1914. "When the hands at New Rochelle have totally recovered from the effects of the Fire Anniversary festivities, they will make another bid for popularity with the release of their long-time producing Joseph in the Land of Egypt. This is on February 1, in conformance with their 'one a month, on the first of the month,' feature release scheme. Marguerite Snow and James Cruze, as Potiphar's wife and Joseph, respectively, are said to have never been seen to better advantage. Their parts and costuming remind one of this team's work in She, one of the very first Thanhouser multi-reel releases. J. Alan Turner has been engaged as technical director of the Big Productions. C.J. Hite took him from a 20-year connection with the stage as a technical expert, wherein he constructed numerous novel effects for such employers as Augustin Daly and the New York Hippodrome. At the time of the Hudson-Fulton Parade in New York, Mr. Turner acted as chief of construction at a paraphernalia incidental to the staging of this big public event." 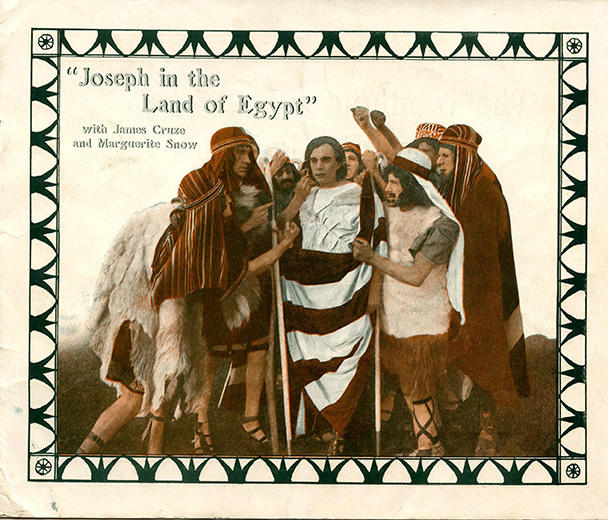 "Thanhouser's JOSEPH IN THE LAND OF EGYPT Plays to a Half-Dollar audience! We've always claimed it! We've always had faith in it! We've always been positive of it! That a Thanhouser Big Production could get any admission an exhibitor cared to charge - and that 50 cents wasn't too much! Why, the famous, high-class Wieting Opera House of Syracuse, New York, booked in our Joseph in the Land of Egypt at 50 cents admission for a half week - that's as long as they 'house' the best legitimate shows - and held it over for the full week! The takings were simply enormous! The best people in town turned out, as they do for the regular high-grade legitimate shows. The Syracuse Post Standard said: 'The film deserves, as compared with the trash which many moving picture entertainments offer, the support of those who wish to encourage efforts to make this form of entertainment something more than mere sensationalism.' Better see the nearest Continental or Mutual feature office for the attractive arrangement that gives you Thanhouser Big Productions...."
"Jacob, the Hebrew patriarch, had twelve sons, but the one he loved the best was Joseph, who was next to the youngest. Joseph was more obedient than the others and his father, impressed by his filial devotion, made him a coat of many colors. This sign of the father's preference angered the older brothers and they grew to hate Joseph. The older brothers journeyed away from their home with their flocks, and Jacob sent Joseph to them with a message. When Joseph came to his brothers they seized him and cast him into a pit. A caravan passed on its way to Egypt and the cruel brothers sold Joseph as a slave. The caravan took Joseph to Egypt, while the brothers, dipping Joseph's coat in goat blood, brought it to their father, telling him that they could find no trace of Joseph. Jacob, grief-stricken, believed that his son had been devoured by wild beasts and would not be comforted. When the caravan reached Egypt, Joseph was sold as a slave to Potiphar, captain of Pharaoh's guard. His master treated him kindly and placed him at the head of his household. But Potiphar's wife, resentful of Joseph's authority in the household, turned Potiphar against him and Joseph was cast into prison. "In the prison Joseph's charity and kindness was enjoyed by all the inmates. Even the stern keeper liked him and gave him many favors. And when Pharaoh, wrathful at his chief butler and baker, decided to punish them it was into this prison that they were cast. The chief butler one night dreamed of a vine with three branches, which budded and blossomed, and from the clusters ripe grapes came forth, and that he took the grapes and put them in Pharaoh's cup and gave the cup into Pharaoh's hand. He asked Joseph the meaning of this dream and Joseph told him that in three days Pharaoh would restore him to his place. The chief baker also dreamed. In his dream he had three white baskets on his head, and in the top basket there were bake-meats for Pharaoh, and birds ate them out of the basket. Joseph, asked for the interpretation, said that within three days Pharaoh would hang the baker. And on the third day both predictions were fulfilled, and the chief butler, restored to his place, speedily forgot about Joseph. "Two years had passed since the chief butler left the prison to return to court, when Pharaoh himself had a curious dream. He believed he stood by the river, and that seven fat cattle came out of the river, and they were followed by seven lean cattle, who devoured the fat cattle. And he dreamed again that seven good ears of corn were devoured by seven thin ears. None of the Egyptian scholars could tell the monarch what the dreams signified, but the chief butler suddenly remembered the young slave in the prison and told of his prophesies. Pharaoh sent for Joseph, and when he appeared before him, related his dreams and asked what they signified. Joseph told Pharaoh that there would be seven years of great plenty in Egypt followed by seven years of famine. He advised that Pharaoh appoint a capable officer to collect food during the years of plenty so that when the years of famine arrived there would be provisions to sustain his people. "Pharaoh, greatly impressed by Joseph, declared that there was no one as capable as he and appointed Joseph ruler over all of Egypt. During the seven years of plenty Joseph had great granaries filled with corn and other provisions so that when the years of famine followed, Egypt, unlike the other countries, would not suffer. But in the land of Canaan where Joseph's father and brothers lived, food was scarce, and hearing of the abundance in Egypt, they journeyed there. Joseph recognized the brothers who had treated him so harshly, although they little dreamed that the personage could be their long forgotten brother. He gave them corn, questioned them as to their families and then, keeping one of his brothers as a hostage, bade the rest a return to their homes, telling them that if they desired more corn they must bring their youngest brother, Benjamin, with them. Benjamin was the brother whom Joseph loved the best. "The brothers returned in dejection to their homes and told Jacob, their father, what the great lord had said. The supply of food was soon exhausted and they returned to Egypt, taking Benjamin with them. Joseph received them and gave them the food they asked for, but he ordered a servant to secretly place one of his costly cups in Benjamin's bag, and then, when the brothers had journeyed some distance from the city, Joseph's guards overtook them. The cup was found in Benjamin's bag and the brothers were brought prisoners before Joseph for judgment. Joseph fiercely upbraided them for a moment, then sending his attendants from the room, he told the brethren that he was the long lost Joseph and freely forgave them for their sin against him." "The recent production of Strauss' fantastic pseudo-biblical ballet at Drury Lane and Sir Herbert Tree's spectacular melodrama at His Majesty's Theatre have aroused between them an unusual amount of public interest in the once simple and unpretentious Scriptural story of Joseph, and there can be no doubt that this cinematograph version of the familiar tale will, if only for the above reasons, enjoy a very wide popularity. Unlike the creators of these two earlier versions, the Thanhouser Company have been content to remain as faithful as possible to the original narrative, believing that it contained quite sufficient natural drama in its ordinary form without the introduction of all sorts of extraneous and wholly unauthenticated matter. They have divided the story into three stages or parts, headed as follows: Joseph and His Brethren, Joseph and Potiphar, and Joseph in Egypt, divisions into which the tale quite naturally falls. Just as their scenario is straightforward, workmanlike and unaffected so is their presentation thereof. The costumes are so carefully chosen and quite sufficiently accurate in detail; the studio settings are realistic and dignified; and the exteriors are selected with an eye to suitability and avoidance of anachronism. Human emotions (and, doubtless, the expression thereof) may be presumed to have remained much the same throughout all periods of the world's history, and in interpreting in a conventional but sincere and painstaking manner the characters they are called upon to play in this film the Thanhouser artistes have probably adopted the wisest and safest course possible. Mr. Justus Barnes makes an impressive Jacob, even though his performance may not be comparable with Sir Herbert Tree's hoary-headed patriarch; Mr. Arthur Bauer is an admirable Potiphar; and Mr. James Cruze is a capable Joseph, more particularly in the later portion of the film. "There is no doubt that this picture will appeal very strongly to that section of the public for which it is designed. Its reading of the ancient story is as free as possible from disturbing novelties, and the old traditions have been followed carefully throughout except perhaps in the temptation scene where Joseph scarcely preserves the Parsifal-like aloofness towards the passionate woman that one had, perhaps wrongly, imagined to be his. On the other hand, although Mr. Cruze's rendering robs the character of the quality of almost supernatural purity it has been averred by some to possess (especially by Count Kessler, the author of Strauss' scenario), it is for that very reason the more human and sympathetic. Joseph in the Land of Egypt is an excellent production, which can give offence to none, and which will probably give great pleasure to most. It is quite a credit to the Thanhouser Company. (Thanhouser Big Production in three [sic] parts.)"